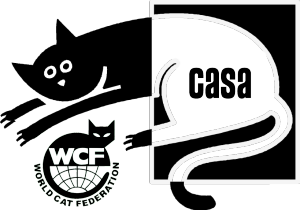 If you are a member or show your cats with CASA, you may use our logo with a hyperlink on your site. We endorse and recommend the Get Me Known microchip identification system. Click on the logo, left for more information. CASA members can buy the chips and inserting device from the club. Microchip numbers are printed on the registration certificates, if available. Contact the Registrar for enquiries. We endorse and recommend Hills Science Plan Food for cats. Our shows mostly have prizes sponsored by Hills and a large percentage of our breeders are members of the Hills Breeders Club. Click on the logo, left for more information. We endorse and recommend Cats Best Litter for cats. Our shows often have prizes sponsored by Cats Best. Petkey.org is a worldwide lost & found pet recovery database. We have been helping animal lovers find their lost ones for over 12 years. We have a lot of detailed info on our site regarding pet ownership, adoption, animal microchips, and dog training.